Make Learning To Multiply Exciting With Fun Multiplication Facts Game. If you want to teach kids to be great at multiplying, you should enjoy using this multiplication facts game. When students learn their basic math facts well, they tend to do better later on in higher level math. Print off and give a game grid to each player. 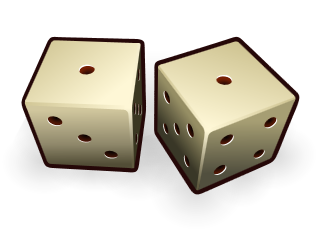 Players take turns rolling two dice. 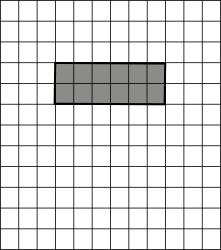 After rolling the dice, the player draws a rectangle on the grid based on the two numbers shown on the dice. The rectangle can be drawn anywhere on the grid as long as the entire rectangle is within the grid. One of the numbers will be the length of the rectangle and the other number will be the width. The player should then make a dark outline around the rectangle and then color it in. For example if a 2 and a 6 are rolled, they would color in a width of 2 squares and a length of 6 squares. See picture below. After drawing their rectangle, on their separate sheet of paper, the player writes the multiplication problem that the rectangle represents. The number of small squares that make up the rectangle is the product of the two numbers on the dice. For the above example, the player writes 2 x 6 = 12 for their multiplication problem. The next player takes their turn and repeats the same process. 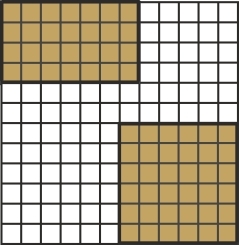 All rectangles must be placed entirely within the grid. The edges of the rectangles may touch, but the rectangles must not overlap each other. And finally, a rectangle can not be placed within another rectangle. Example: Let's say on the second roll of the dice, a 4 and a 5 are thrown. 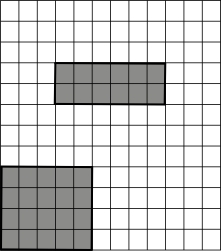 The player might draw their second rectangle as pictured below. As players continue taking turns. When a player rolls two number that gives a rectangle that will not fit on their grid, they drop out of the game. After all players are done, the scores are calculated to see who the winner is. The last player to place a rectangle on their grid gets an extra 10 points added to their total score. Scoring: Each players Total score is the sum of all their products on their grid. To get the total, players can either count the number of small quares they have colored in or just add the products to arrive at the same Total score.